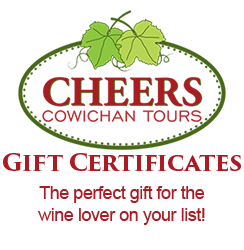 We enjoyed a really nice 4 hour tour with Cheers in early October this year. The bus was full but Cheers was so kind to offer a private custom tour and we visited 3 wineries and also the Merridale Cidery. The weekend was also during the Cowichan Wine Festival and there was entertainment and snacks throughout. The sights are beautiful and we enjoyed the bakery and Hillaries Cheese for lunch in Cowichan Bay. We will definitely want to visit again soon and bring along more friends and family for another tour. Thanks Cheers from Jen &Andy!! Proud recipient of Trip Advisor’s “Certificate of Excellence” Since 2016! Follow us for Hot Deals!